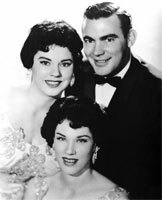 Trio Country US formé en 1955 et composé de Jim Ed Brown (né le 1er Mars 1934 à Sparkman (Arkansas)), Maxime Brown (née le 27 Avril 1932 à Kingstree (Caroline du Sud)) et Bonnie Brown (née en 1937 à Sparkman (Arkansas)). During the '50s and '60s, the Vocals harmonies of the Browns gave the lie to those who would stereotype country music as a raw product distinguished more by pure feeling than by art; perhaps the single word that best describes their music is "polished." The original brother-sister duo of Jim Ed Brown and Maxine Brown were joined by younger sister Bonnie in 1955, creating a trademark smooth trio sound that proved wonderfully adaptable to down-home harmony singing, to folk-pop arrangements that rode the crest of the hootenanny craze, and to lush Nashville sound extravaganzas. Bonnie and Jim were born in Sparkman, AR, where their father owned a sawmill and a large farm; older sister Maxine was born in Campti, LA. With the encouragement of their parents, the Brown children began singing and developing their characteristic close harmonies early on. In their teens they performed in school and began appearing at local events. In 1952, Jim Ed placed second in a talent contest and won a slot on Little Rock's Barnyard Frolics radio program. Joined by Maxine, he was soon appearing on other local radio shows, which led to local TV appearances as well. The duo earned national recognition and a guest spot on Ernest Tubb's television show for their humorous song "Looking Back to See," which hit the Top Ten and stayed on the charts throughout the summer of 1954. The Browns were joined by recent high school graduate Bonnie and began appearing on Shreveport's Louisiana Hayride. By the end of 1955, the trio had another Top Ten hit with "Here Today and Gone Tomorrow," which was given a boost by their national appearances on The Ozark Jubilee. The show's producer arranged for them to sign with RCA Victor in 1956, and soon afterward they had two major hits, "I Take the Chance" (a cover of a Louvin Brothers composition that showed how close the Browns remained to traditional harmony textures) and "I Heard the Bluebirds Sing." When Jim Ed was called to serve in the military, the group continued to record while he was on leave, and sister Norma filled in for him on tours. By the late '50s, the Browns, now teamed with RCA's visionary producer Chet Atkins, had become one of the country acts that were most successful in exploiting the new national enthusiasm for folk music. On album covers they were pictured with a clean-cut, almost collegiate look that diverged sharply from country norms. The Nashville songwriters responsible for creating the sentimental, romantic world of Eddy Arnold's music contributed idealized visions of small-town life such as "The Old Village Choir" to the Browns' repertoire, but a song whose origin was not even American gave the trio its biggest hit. "The Three Bells," a translation of a hit song by hard-bitten French chanteuse Edith Piaf, not only spent ten weeks on top of the country charts in 1959, but also crossed over and spent four weeks at number one on the pop charts. 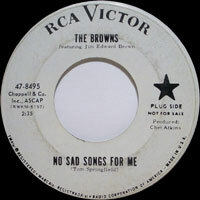 As a result, the Browns appeared on The Ed Sullivan Show, The Jimmy Dean Show, and American Bandstand. The Browns remained in the folk mode for their two follow-up hits, "Scarlet Ribbons" and "The Old Lamplighter," both of which did extremely well on both country and pop charts. Their string of hits continued until 1961, when the first phase of the folk boom died down. Two years later, after touring widely in the U.S. and Europe, the Browns joined the Grand Ole Opry. In late 1967, the Browns disbanded. 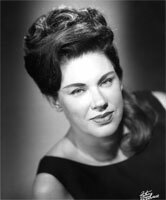 Maxine and Bonnie went back to Arkansas to concentrate on their families, while Jim Ed focused on the successful solo career he had launched in 1965. 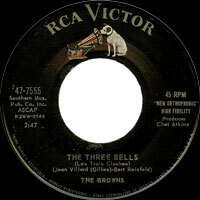 A four-disc retrospective of the Browns' music was released under the title The Three Bells on Germany's Bear Family label in 1997.